Today we have a wonderful double feature of two amazingly done Blu-ray’s by the one and only company Twilight Time. Both movies capture great acting, flawless cinematography, and is directed in a wonderful, stand out way. Both films are memorable, and both are something to return to often or at least I will. Twilight Time gave a wonderful outlet for both these films. These films fit perfectly on Blu-ray. Both are worthy products to enjoy and speak highly of. Twilight Time has allowed these older films to be enjoyed on new outlets. Another great example of Twilight Time’s choices of films. Many times Twilight Time chooses forgotten, or overlooked cinema. These Blu-ray products and all Twilight Time products should be owned and enjoyed. Twilight Time always, give great Blu-ray products to a film loving world, and these products should be bought and watched and enjoyed. First up is: How to Steal a Million. This film has two iconic actors starring. The amazing one of kind Peter O’Toole and the amazing, beautiful, gorgeous Audrey Hepburn, both of them need no introduction. All film lovers should know these two unique masters of cinema. Each one displays a flawless performance as would be expected. This also has a wonderful ensemble cast of excellence and mastery. How to Steal a Million is absolutely pure entertainment at its best. A wonderful romantic drama mixed with comical wonder, and most of all stunning acting and direction. A pure delight for any fan of cinema. The story is about an art forger named Charles Bonnet played flawlessly by Hugh Griffith. He has an ultimate passion for art yet his devious way of forgery is about to get him in hot water. One of his forgeries ends up in a Paris Museum. There the museum finds out that it’s not a real masterpiece. His daughter Nicole played by Audrey Hepburn must help her father protect his name, so she hires a career burglar Simon Dermott to break into the museum and steal the sculpture before it’s too late for her father. Directed by the wonderful William Wyler who helped created many wonderful pieces of cinema, from director to producer. His long vast career won him many nominations and wins. Directing such classic as 1939’s Wuthering Heights, 1949’s The Heiress, 1959’s Roman Holiday, 1961’s The Children’s Hour, 1968’s Funny Girl. He won many Academy awards for such classics like 1942’s Mrs. Miniver, 1946’s The Best Years of Our Lives. He also won best Director for the one of kind masterpiece 1959’s Ben-Hur, which is one of my all-time favorite films. He was a multitalented movie man, from screenwriter, director and producer. In his 79 years of life, he left the world of cinema with many prime examples that stand out. 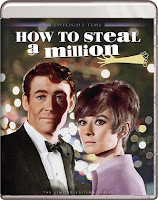 I think How to Steal a Million is one of those wonderful examples of comedy, flawless acting and awesome tight direction that shines. He movies truly stood out. I think that is one thing about Wyler, that his films are movies you want to return to repeatedly. That’s the prime example of his genius. The story was based on a short story titled Venus Rising written in 1962 and published in Practice to Deceive by George Bradshaw. Starring the wonderful and amazing duo of comedy. Iconic actors and comedians Jack Lemmon and Walter Matthau. This is a wonderful, funny over the top romp that shines. A classic comedy that never fails when seeing it. I have seen this movie many times. Directed by the one and only master of cinema Billy Wilder. Wilder was a truly amazing and gifted director, producer and writer. He was one of a kind that brought many memorable and important pieces of cinema to light. His movies also are ones that linger with us. Such awesome movies as 1945’s The Lost Weekend, 1950’s Sunset Boulevard, 1953’s Stalag 17, 1954’s Sabrina, 1955’s The Seven Year Itch, 1957’s Witness for the Prosecution, 1950’s Some Like It Hot, 1960’s The Apartment, and so many more. His movies where award worthy and garnered many upon many Oscar nominations and wins, for his direction and for his actors and actresses, to be exact 14 performances where nominated. He was a flawless example of a director that knew what he wanted and expressed the ultimate ability to create characters that stood out in so many wonderful ways. The Fortune Cookie is a prime example of that reality with Jack and Walter. Both shine in complete beauty when it comes to expressing oneself in there many acting roles. 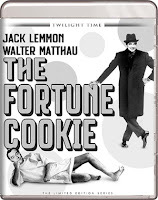 Jack and Walter playing Harry and William is priceless in The Fortune Cookie. Twilight Time picked two wonderful comedies to express the beauty of Comedy Cinema of the older days. Both are simpler fun comedies that truly stand the test of time and shine brilliant today as they did when they came out, and Twilight Time has expressed two awesome transfers to 1080p High Definition, and that is what brilliance is all about. Both of this films have an audio spot on, crisp and clear. The picture for both are vibrant, one black and white, the other color, and is an excellent viewing of just how to treat older films through restoration in High Definition 1080p. Isolated Music Track: Another example of this film is the music displayed and performed by John Williams who needs no introduction and was a master music composer that left the world with a great, vast brilliance, and love of music. He has composed and worked on many upon many films and TV projects in his life. Sadly this master passed away but left an amazing range of music which can be heard throughout his vast career of films. His music is still used today and rightly should be. Master John Williams creates amazing soundtracks that are created into ultimate and magically excellent music experiences. Audio Commentary with Actor Eli Wallach and Catherine Wyler. A wonderful listen. Both talk about the film in many ways and the listen is perfect for lovers of this movie. Audrey Hepburn: The Fairest Lady: This is a truly wonderful program with a running time of 45 minutes. A perfect biography on the amazing one kind star. You also get the one and only booklet by film guru and goddess Julie Kirgo, which is always a brilliant little booklet for fans of cinema. Isolated Music Track: The man behind the music for this feature film is Andre Previn. Previn has worked on many films as composer, or in the music department. He has graced the cinema world by working on 64’s My Fair Lady, 58’s Gigi, Rollerball and his music has been used on many soundtracks to films and TV and projects. A great listen. I will say this again, as I have said many times before. Twilight Time is one of the greatest companies out there supplying and giving to movie lovers, fans and film historians a great trip into the world of lost, and sometimes sadly forgotten gems of the olden days of cinema. Twilight Time has done it yet again with these two priceless examples of top quality, high class products.